Treezy rocking the #12 stickers. Time to open up the old email-bag. Received this one the other day. I'm wonder whether you know the story with the helmet numbers? Are those there to stay for the time being? I assume they are given that they were back on the helmets this spring. Personally, I think they make the helmets look way too busy. 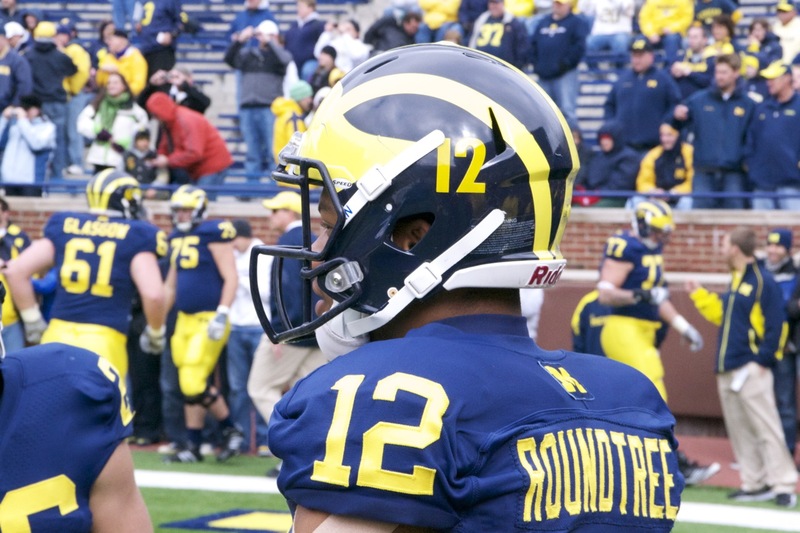 Plus, the Michigan helmet is so classic without those numbers. It seems to me that adding numbers is just unnecessarily tinkering with a great look. For whatever reason, it wouldn't bother me as much if they went back to the sticker look they used to sport (I think because that doesn't fundamentally alter the helmet). Obviously there's not much to complain about as far as Brady Hoke goes. But this particular change is one I'm not thrilled about. And I assume I'm by no means the only fan who feels that way. So anyway, if you have the inside scoop on what the future holds for the helmet numbers, I'd be interested to know. It would seem as if the use of the numbered helmet stickers least season created quite a stir among the Maize & Blue faithful. Love em or hate em, you rarely hear of anyone who doesn't have a pretty strong feeling either way. Let's face it, the Michigan helmet is timeless in it's design. Many college helmets are. When the stickers found their way into the helmets for the Legacy jerseys against the Irish, pretty much everyone was willing to give them a pass for obvious reasons. So when the stickers showed up on the helmets again three weeks later against Minnesota, with the rest of the traditional home unis intact, that was interesting. Brady Hoke addressed it in the post-game presser. So. There you go. I suspect we're not going to be honoring everyone who's represented Michigan in the same fashion this year as well, so I expect the stickers will be eighty-sixed come September 1st. I also think the spring game is basically just a carry-over from 2011 in terms of equipment/helmets/jerseys used, so no real alarms there. But the reason they were brought back midway through last season was because the players really liked them. This is the part of the post where I could stray way off into a whole long-winded point about how us old farts hate when classic college football uniforms are tinkered and messed with (shaking our fists at the television). But the simple reality is, players really don't care so much about the history and tradition of the uniforms. Yes, there is a measured difference between Michigan and, say, TCU when it comes to the look, style and feel of the program (or as @DaveBrandonAD would call it, branding), but it also needs to balance with the desire of the players to want to feel relevant in this Oregon-style counter-culture that has emerged. The legacy throwbacks worn for the Notre Dame game and the Michigan State game last year were not what anyone would call attractive. But, I think to the players they were different, and fun. And from that standpoint, I have no issues with it. As long as it doesn't become the norm, I'm all for these random awkward attempts at keeping up with the Jones', so-to-speak. The Legacy jerseys worn for ND were a mild success by most accounts. And the away versions worn in East Lansing were a giant swing and a miss. Hopefully lessons were learned from that one. I hope they keep the helmet numbers and use the legacy unis again this year at some point. In fact, I liked both so much, I bought them.